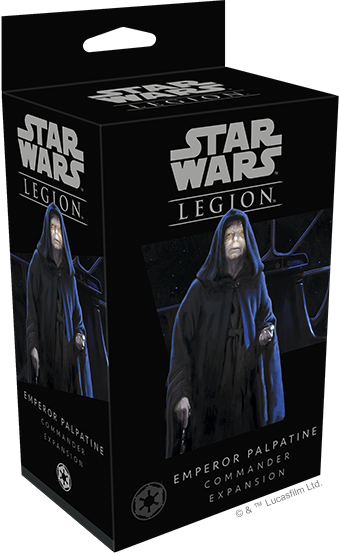 Fantasy Flight Games is happy to announce the Emperor Palpatine Commander Expansion for Star Wars™: Legion! Order your own copy of the Emperor Palpatine Commander Expansion at your local retailer or online through our website today! The Galactic Empire encompasses countless star systems, ruling over the galaxy with an iron fist. Sitting at its head is Emperor Palpatine. As the ultimate ruler of the Empire, all bow before him, even the fearsome Darth Vader. A brilliant manipulator who almost singlehandedly orchestrated the fall of the Jedi order and his own rise to power, the Emperor makes a perfect addition to Star Wars: Legion as a commander of the Imperial forces. 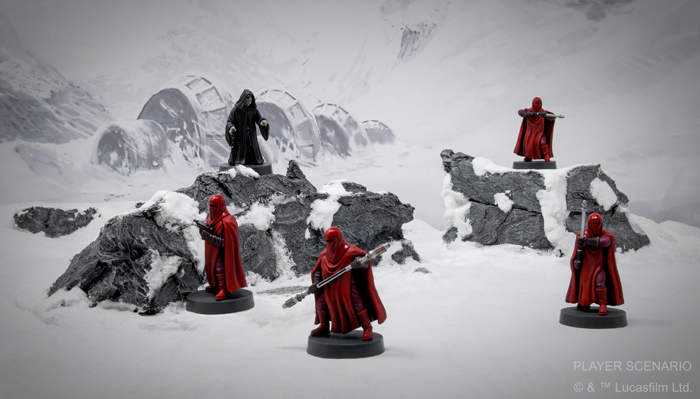 Releasing alongside the Imperial Royal Guards Unit Expansion, you’ll be able to field Emperor Palpatine and his full entourage in the fourth quarter of 2018. With the Emperor Palpatine Commander Expansion, Emperor Palpatine can take his place as the supreme commander of the game’s Imperial forces. In this capacity, he can join fellow Imperial commanders Darth Vader or General Veers on the battlefield, showing your opponent the true power of the dark side with fellow Force user Darth Vader or bringing the weight of the Imperial legions to bear against the enemy alongside General Veers. Either way, Emperor Palpatine combines powerful combat potential with his status as ruler of the Galactic Empire to mobilize his troops on an unmatched scale. Despite what his frail appearance might suggest, Emperor Palpatine is more than capable of doling out damage. His command over the dark side is so strong that he can use it to summon powerful Force Lightning to strike down any opponents that threaten him, even those who attempt to engage him in melee combat. These attacks are so intense they easily pierce through the enemy’s defenses and rival the AT-ST in sheer destructive power. 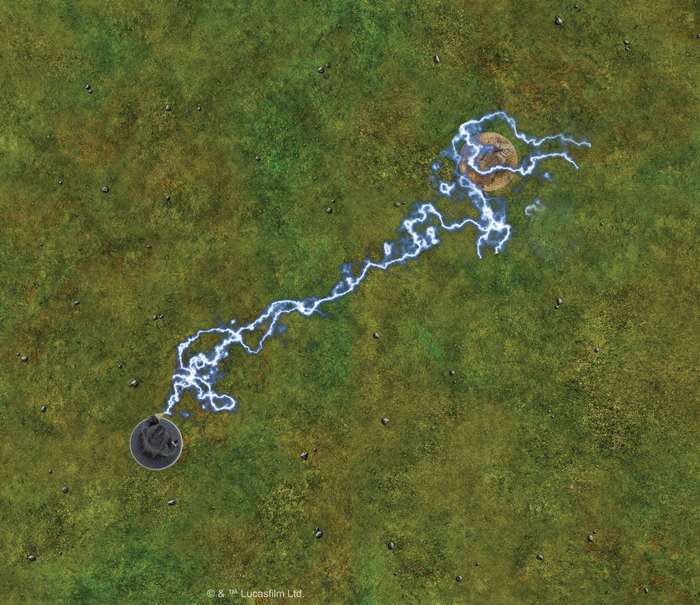 Emperor Palpatine unleashes a flurry of Force Lightning against Luke Skywalker! 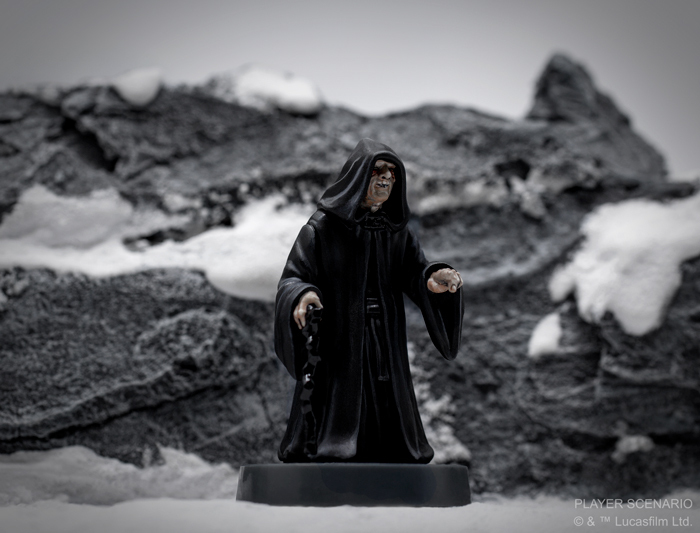 Emperor Palpatine is undoubtedly powerful, but that does not mean he isn’t vulnerable. He moves at a plodding pace, making him an easy target for enemy units that are more fleet of foot. To get close enough to launch an attack, however, these units will inevitably have to contend with the Emperor's Royal Guard. 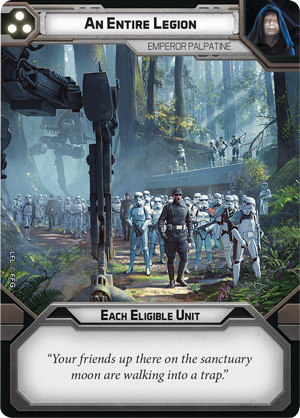 His position as the head of the Empire means the Emperor is afforded special protections, and he allows you to ignore the rank of one unit of these elite warriors when building your army, freeing space for you to include other special forces units. With a powerful attack that influences the flow of the battle around him and abilities that bend the rules of army-building, Emperor Palpatine clearly enjoys extending his control to every aspect of Star Wars: Legion and this control even stretches to your overarching strategy through his three signature command cards. The Emperor commands vast amounts of power, both with the Force and through the military strength of the Empire, and his command cards let him tap into both. When he needs it, for example, Emperor Palpatine has An Entire Legion of troops at his beck and call, ready to strike exactly when he wants them to. We’ll take a closer look at all of Emperor Palpatine’s command cards and everything included in the Emperor Palpatine Commander Expansion in a future preview! Emperor Palpatine sits at the head of a galaxy-spanning empire with unfathomable amounts of power at his fingertips. Soon, you’ll be able to bring this power to bear in your games of Star Wars: Legion. Look for the Emperor Palpatine Commander Expansion (SWL22) and the Imperial Royal Guards Unit Expansion (SWL23) to release together in the fourth quarter of 2018! 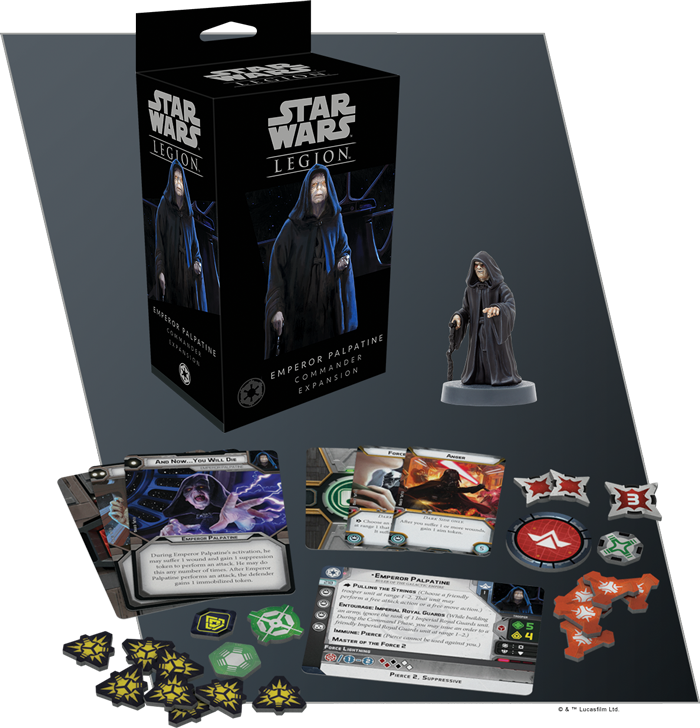 You can pre-order your copy of the Emperor Palpatine Commander Expansion at your local retailer or online through our website today.